A guest loco is a temporary created loco object which will be deleted at server shutdown. 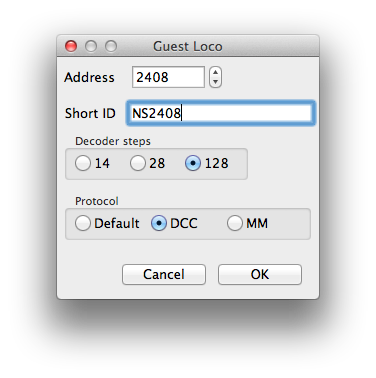 The given address is used as Loco ID if the short ID is left empty. The guest loco will appear in the loco table and can be controlled as a normal loco. Protocol is DCC but depends on the connected Command Station. The new Guest Loco is automatically added to the list. Open the Loco properties and click on the Apply button to permanently keep a guest loco.